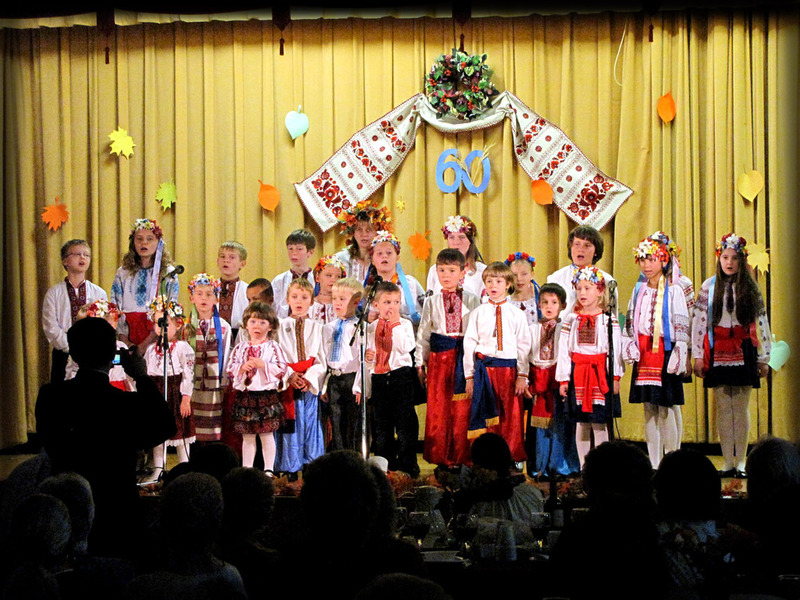 Ukrainian Orthodox Church of the USA - 60th Jubilee of St. Mary the Protectress Cathedral in Southfield, MI! 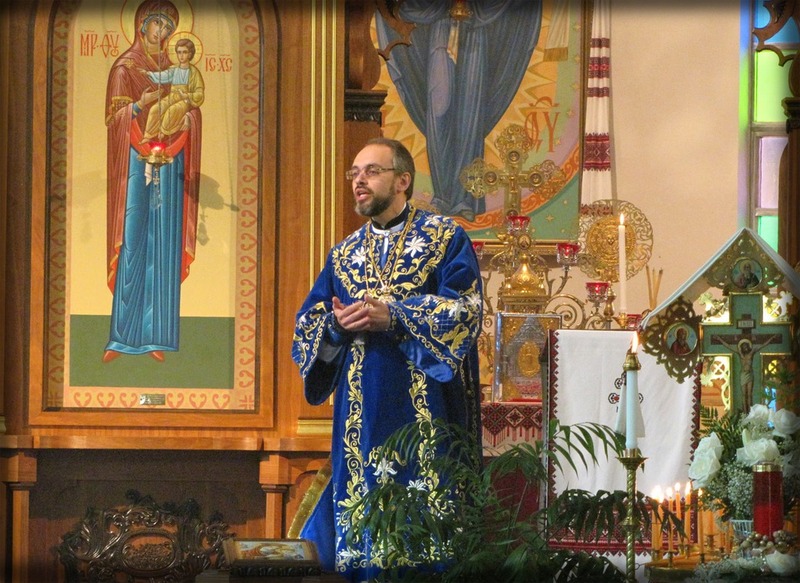 60th Jubilee of St. Mary the Protectress Cathedral in Southfield, Michigan! 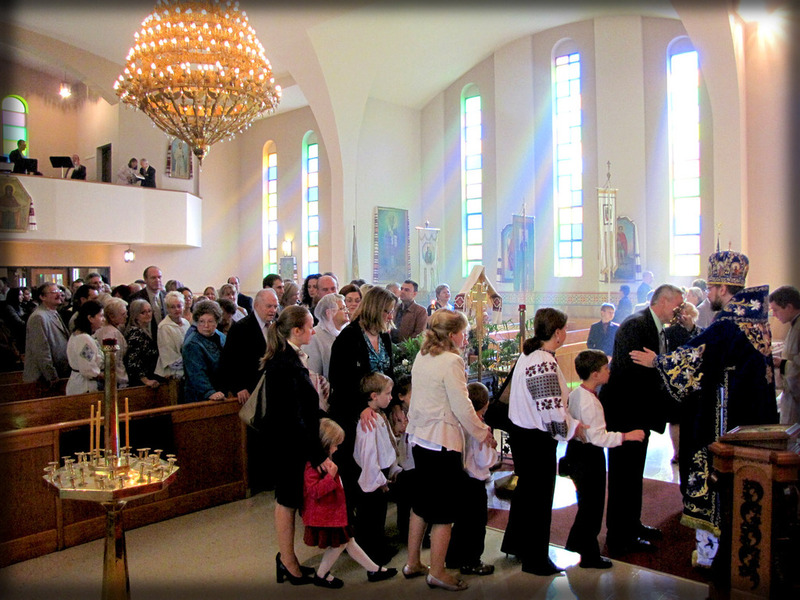 Still energized from last weekend’s hierarchical visit by His Grace Bishop Daniel to the their sister church of Holy Trinity in Dearborn, the parishioners of St. Mary the Protectress Cathedral in Southfield, Michigan, rejoiced anew this weekend as His Grace joined them to commemorate their 60th Jubilee and Parish Feast Day celebration! 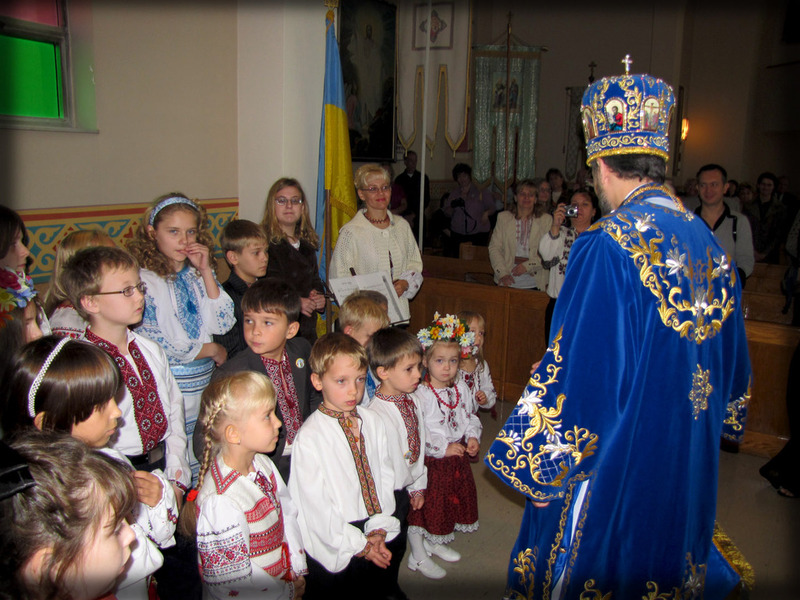 The weekend began Saturday afternoon as the children of the Lesia Ukrainka School of Religion and Ukrainian Studies greeted His Grace, as he arrived to spend some time with the youngest members of his flock. 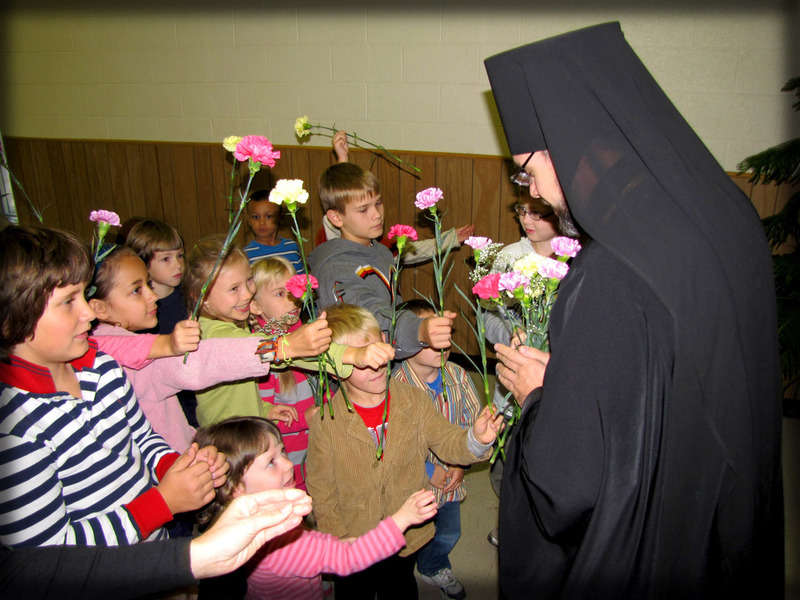 The children gleefully greeted Bishop Daniel as he entered the church hall with myriads of colorful carnations. The children squealed with joy as they reached out to hand their flowers to His Grace, only to be pleasantly surprised as His Grace redistributed the flowers right back to each child in turn, making each one feel recognized and special. With flowers joyfully waving in the air everyone settled down for a pizza lunch. 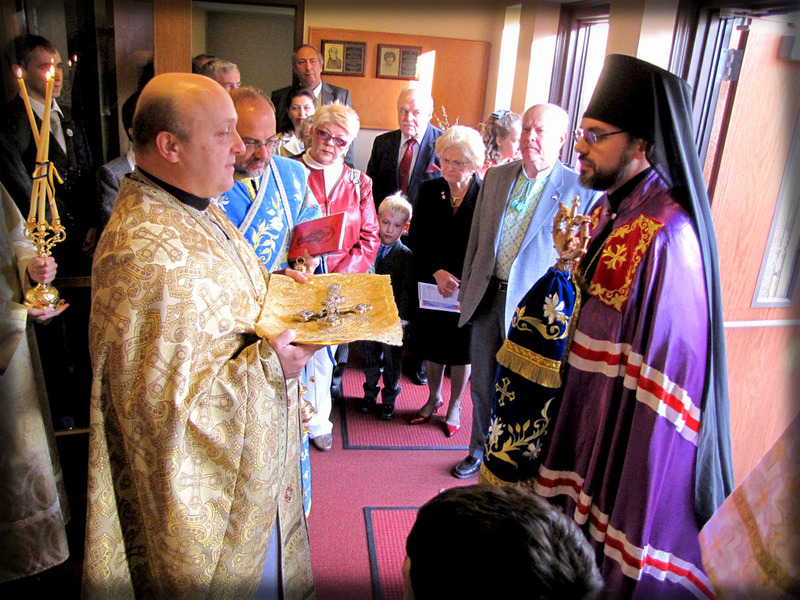 Joining His Grace Bishop Daniel, was parish pastor Very Reverend Father Paul Bodnarchuk, as well the pastor from Holy Trinity, Reverend Father Andrew Rogers, along with seminarian of St. Sophia Ukrainian Orthodox Theological Seminary (South Bound Brook, NJ) Subdeacon Vasyl Dovgan. While the children nibbled on pizza, His Grace answered some of the questions the children had prepared for him. All too soon the school bell rang and the children begrudgingly returned to their rehearsal for Sunday’s program. In the evening His Grace Bishop Daniel returned to the cathedral for evening vespers. The noise from the afternoon had vanished and been replaced by a peaceful silence. 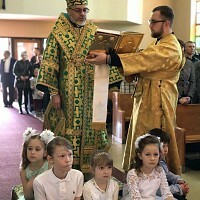 Protodeacon Ihor Mahlay censed the cathedral as the clear and somber voices of the choir members chanted the words of Psalm 103, “Bless the Lord, my soul. Lord my God; You are very great”. The incense floated ethereally in the evening rays of the setting sun, adding an atmosphere of mystery and reverence to the evening service. Upon the conclusion of the Vespers Service, His Grace gave a short sermon, reflecting on the magnitude of what has transpired within this parish for last 60 years. 60 years of baptisms, marriages, and funerals. 60 years of preaching the Word of God, and mostly 60 years of sharing the Eucharist as one family from one Chalice. His Grace reiterated how today the children rehearsed their play on stage, how the windows were getting washed, new curtains were hung, and the tables were getting covered in new linens. It seemed that everyone was preparing for a celebration; everyone was expecting guests. However, His Grace reminded us that each Liturgy we a guest arrives. 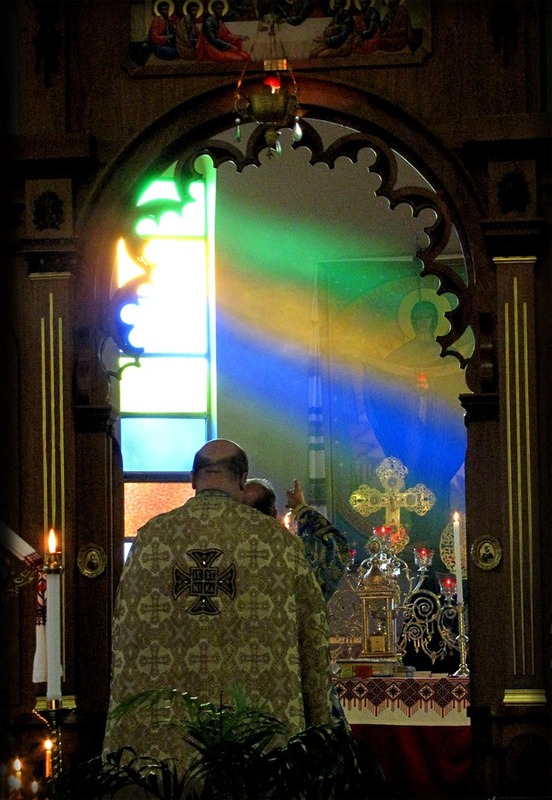 During each Liturgy Christ is among us. We need to always be this excited and happy, and we need to always prepare not just our buildings but, our souls to greet Him. The world has become filled with insensitivity and people have become callous and unfeeling. The world screams for someone to love it and to touch it. His Grace hopes that each one of us hears that scream and answers it by going out into the world and sharing Christ’s love, through our deeds and actions. That we, as a parish, heed the call, and make a positive and significant difference in the world. At the conclusion of Vespers everyone went up to get anointed with Holy Oil and to take a piece of blessed bread. Later they all gathered in the church hall for a light snack and a much awaited opportunity to reconnect with their beloved hierarch. His Grace kindly and patiently listened to everyone and took the time to reach out to each person, to meet their needs, and to give them the much craved contact with their Shepherd. Just like the children were sad to part with Bishop Daniel after lunch, so now were the adults saddened to say goodnight. However, His Grace cheerily instructed them to go and get some rest for they all had a festive celebration in the morning. As promised, the morning was glorious and joyous. The sun shone brightly as the people gathered early in order to greet their bishop. They filled the church and overflowed down the steps to the outdoors. Their excitement barely kept in check, the children craned their necks trying to spot His Grace’s arrival. 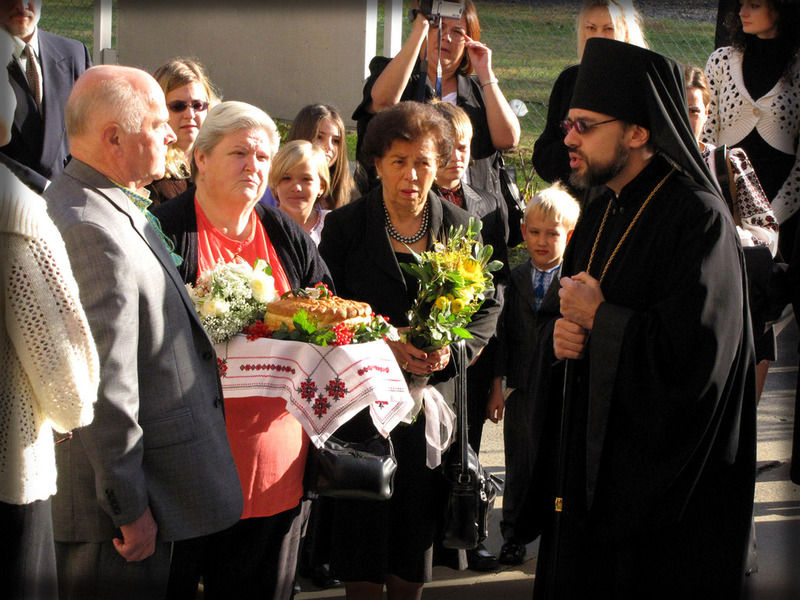 Father Paul Bodnarchuk and Protodeacon Ihor Mahlay awaited the bishop’s arrival in the narthex. The son of Protodeacon Ihor Mahlay, Orest, joined altar servers Andrew and Michael Powers, Yarema Petrusha, and Subdeacons Vasyl Dovgan and Andrew Stoiko serving in the Altar this Sunday. Smiles erupted all around as His Grace rounded the corner and walked up to the front of the church. 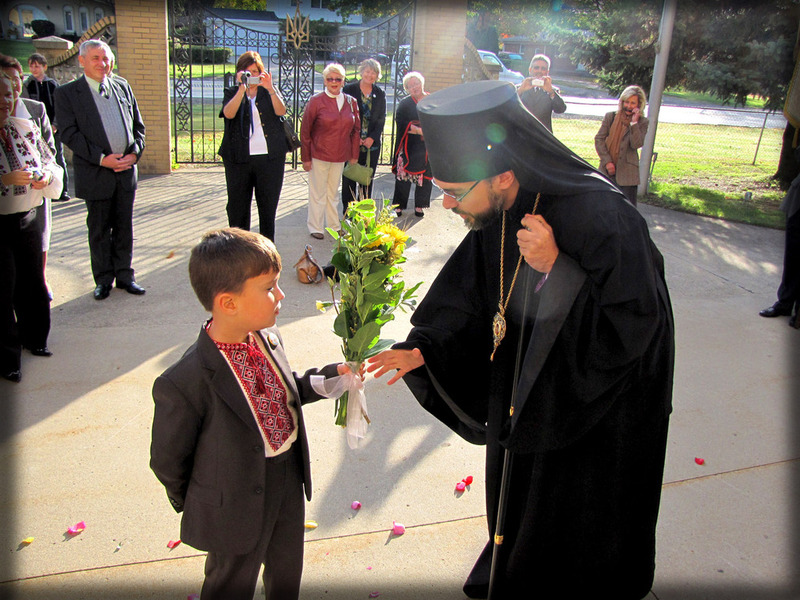 Little Gabriel Poletz greeted Bishop Daniel on behalf of the Lesia Ukrainka School, and Liza Jones represented the Junior Ukrainian Orthodox League. 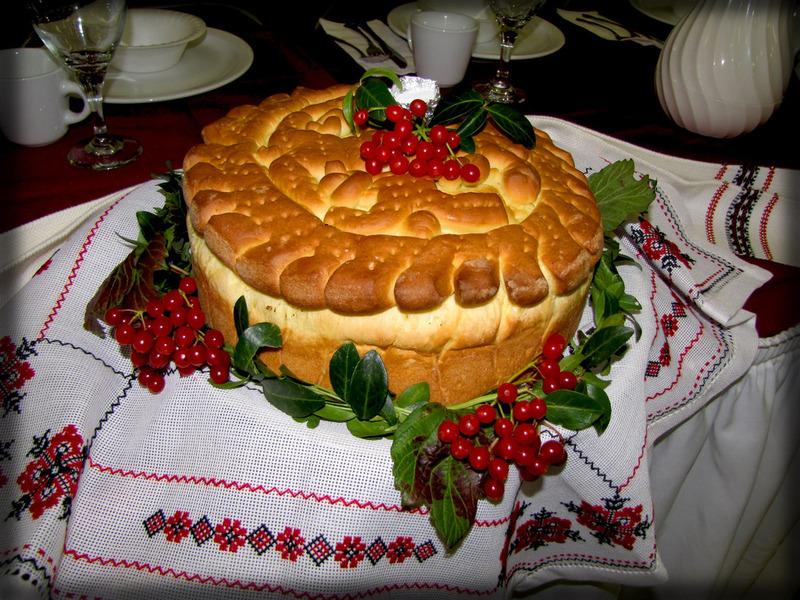 Georgia Kereliuk, the St. Olga’s Sisterhood president, along with Wara Syrij greeted His Grace with the traditional bread and salt, while Parish Board President, George Korol extended his warmest greetings from the parish. It was amazing to see so many people remain so silent, hanging on every word His Grace spoke. The silence was broken in a spectacular fashion, as His Grace entered the cathedral and the choir erupted in song. 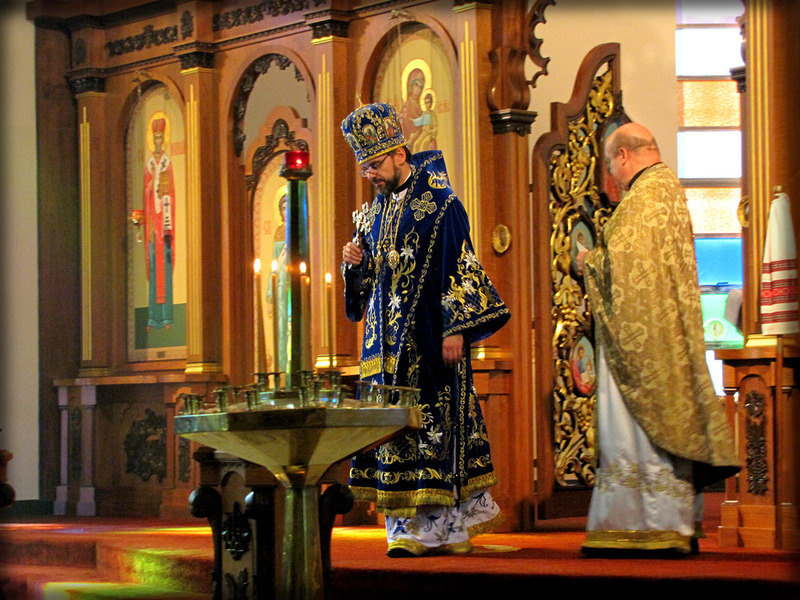 As they loudly sang “It is right in truth to glorify you, the Birth-Giver of God…” Protodeacon Ihor Mahlay loudly proclaimed the Glory of Christ with the words “Holy God, Holy Mighty, Holy Immortal, have mercy upon us,” leading the entrance of the bishop into the cathedral. As His Grace stopped in the middle of the cathedral, amongst his flock, the church overfilled with worshippers, the straggles not walking, but running into the temple. Amongst the majestic background of the joyous sound of singing and praying, Bishop Daniel stands humbly before his flock to be vested by His Church. 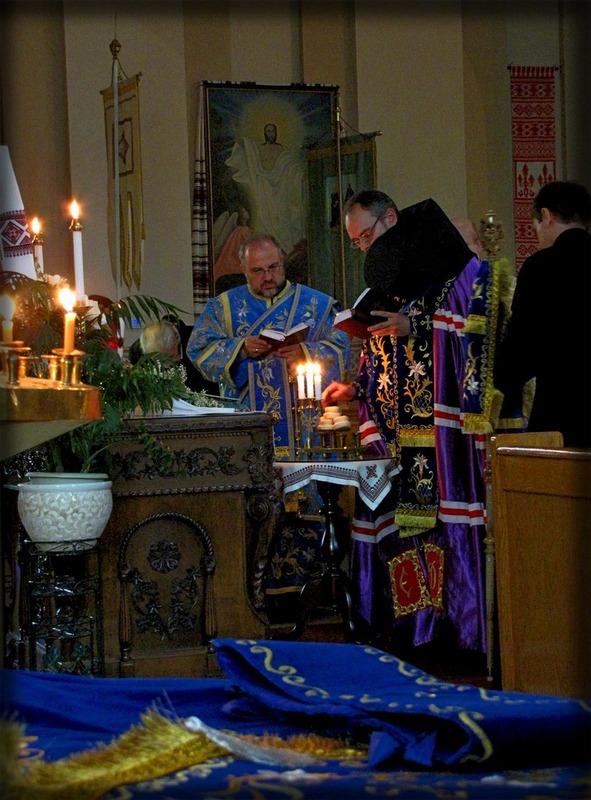 Subdeacon Vasyl Dovgan assists in vesting His Grace, as Protodeacon Ihor Mahlay stands on the Ambo and loudly proclaims the prayers of Vesting, describing the purpose behind each vestment, starting with the vesting of the white Stikhar, which represents the white baptismal gown worn at baptism symbolizing “putting on Christ”, to the final vestment of the Mitre, when the Protodeacon prays: "O God, You have crowned him with glory and honor..." (Psalm 8:6; Ps. 20/21:6,5). 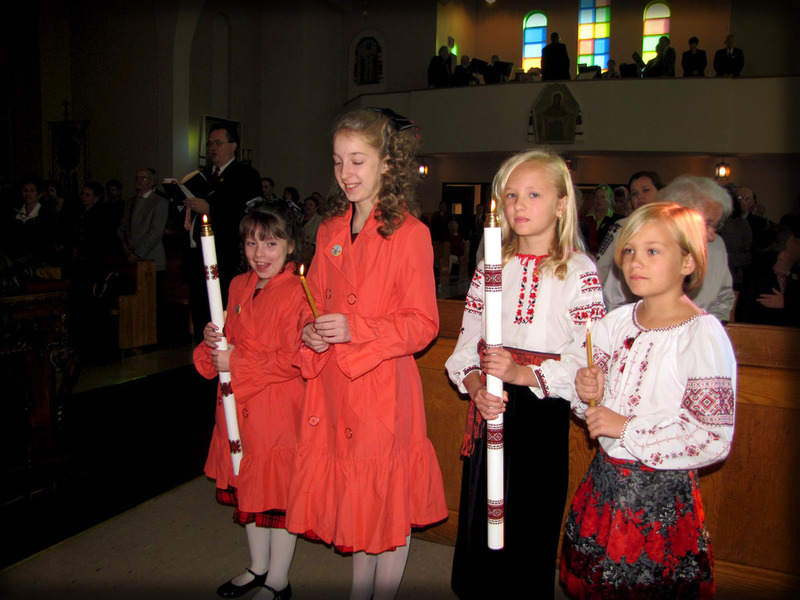 The children in the church held candles for the reading of the Gospel which was from Luke 10:38-42, about the dilemma of the two sisters Martha and Mary. Immediately following the reading, His Grace gave his sermon concerning these two typical sisters. Martha works hard trying to keep the household and life in order, while the other sister, Mary, seems to sit idly by, listening to Christ teach. His Grace asked everyone which sister was correct in her behavior. Was it Mary who sat at Christ’s feet and worshiped, or was it Martha, who diligently worked to keep order? Bishop Daniel explains that while it seems that spiritual nourishment gained by Mary is more crucial to salvation than menial household duties done by Martha, this first impression might be slightly misleading. How can a good Christian sit by idly while another is working hard? It is our duty to help others, not just our immediate family but, everyone, for we are in truth all one family. His Grace reiterated that one must find a happy medium between these two seemingly opposite natures of humanity. One must not work so hard, cleaning the church, buying candles and cooking in the kitchen, that they are so tired and do not find the time to actually enter the church and pray. Neither should one simply attend services, and not be concerned with the various aspects of church life that keep the church and parish alive and active. It is crucial to do both. A lack of either is detrimental to one’s salvation. Therefore, neither sister was completely in the right. We need to be both Martha and Mary. We need to enter the church and pray, but, we also need to be active in the upkeep of the parish, the community and the world. Lacking either, would be merely existing in this world. Bishop Daniel challenged us not to only “exist”, but, to “live”. Living requires stepping outside one’s comfort zone and going the extra mile. Upon the conclusion of the Divine Liturgy everyone made their way to kiss the Cross and receive their bishop’s blessing. Like the ebbing of the tide, slowly the church emptied and the church hall filled. 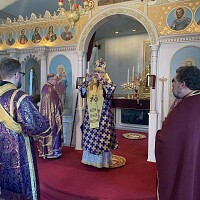 Having concluded Liturgy at their own parishes, a number of clergy from neighboring Orthodox parishes of various jurisdictions arrived to join the celebration of our Feast Day. Among these were Father Lawrence Lazar, Dean, St. George Romanian Orthodox Cathedral in Southfield, Father Sobin Popp assistant priest at St. George, Very Reverend Andrei Alexeiv from Holy Ascension Serbian Orthodox Church, Subdeacon Robert Mitchell, president of the Council of Orthodox Christian Churches in Detroit. 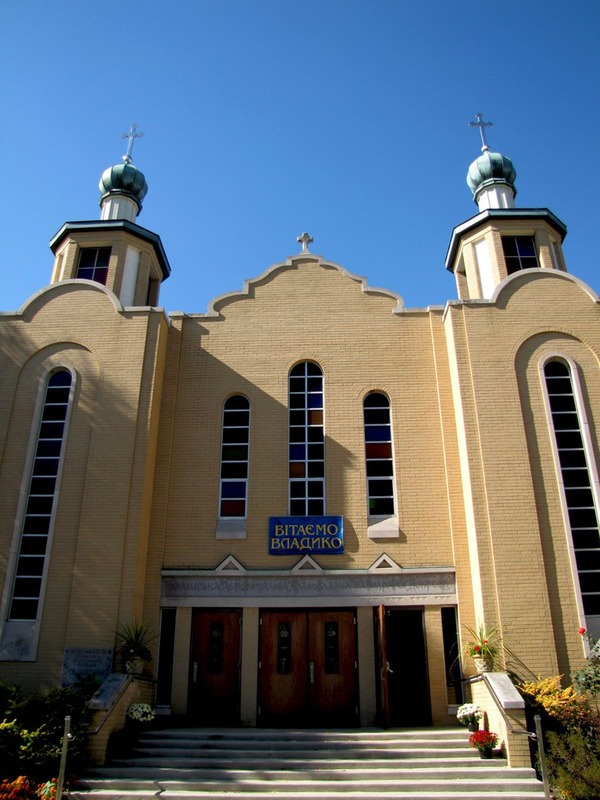 Their presence was an encouraging sign as to the health of the Pan Orthodox Community in the metropolitan Detroit area. Just as it should be, all the Orthodox came together to celebrate a joyous occasion. It was just as His Grace had stated in his sermon. We are all one family and need to support each other. We need to be both Martha and Mary. While these clergy concluded their worshipful duties as Mary, they now fulfilled their roles as Martha. 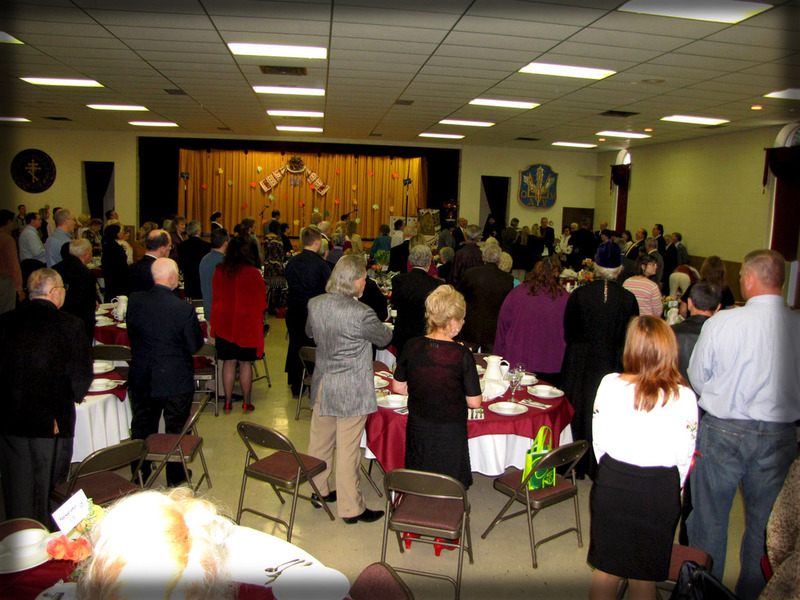 The banquet was sold out and the church hall was filled with people from various nationalities and churches who came to celebrate St. Mary the Protectress’ 60th jubilee. Guests were warmly greeted and new friendships were kindled. 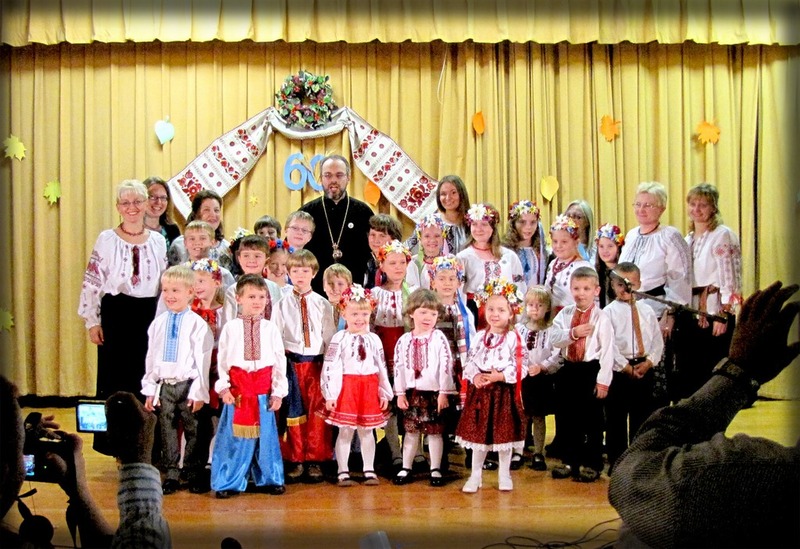 After the opening prayer led by His Grace, Andew Smyk the Master of Ceremonies, introduced the guests, and introduced the director of the Ukrainian School, Victoria Volyanuk, who then said a few words about the school, and kicked off the celebrations by opening the school program. The children recited prayers, poems and songs, and wowed everyone with their amazing dance skills. 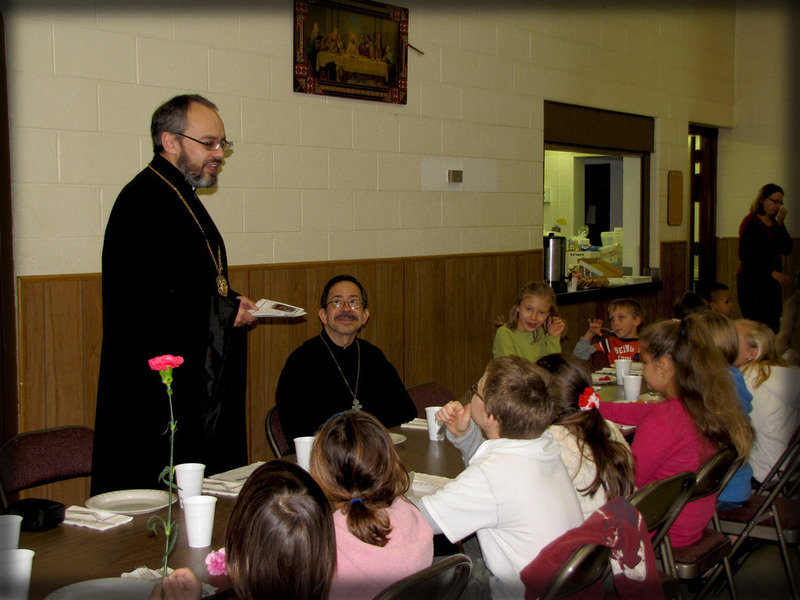 Upon the completion of the school program was served a delicious luncheon, during which Andew Smyk made various announcements and declarations of people’s memories from the past 60 years of parish life. 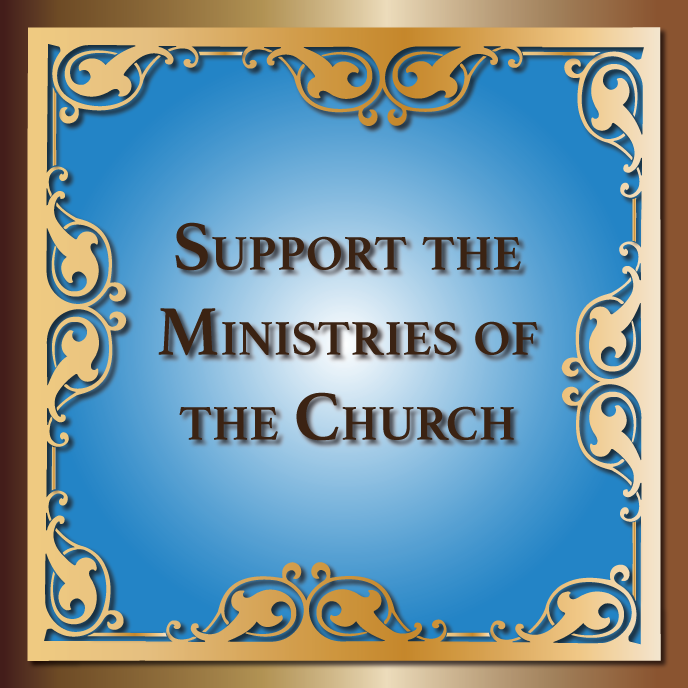 Throughout the afternoon people kindly donated funds in support of various Church causes, Consistory needs, Jr. U.O.L. and orphanages in Ukraine. 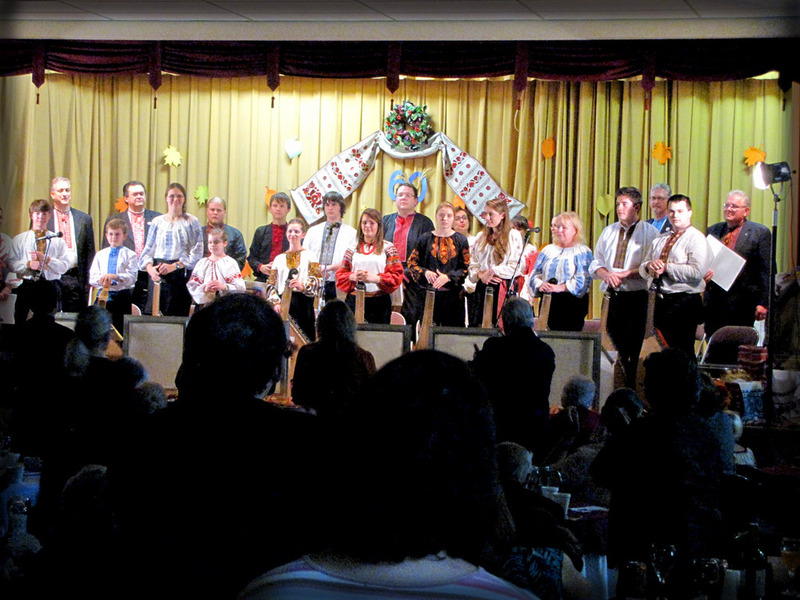 As the plates were cleared Protodeacon Ihor Mahlay took the podium for a few words, and then introduced the second half of the day’s entertainment – the Kobzarska Sich, conducted by Yurij Petlura, whose members traveled from various states and countries to attend this show. 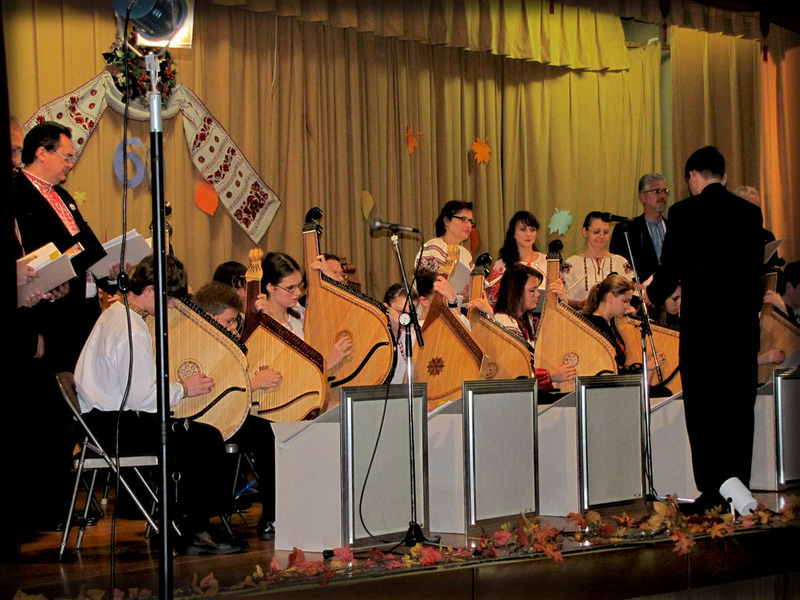 The performers impressively played the bandura and sang traditional Ukrainian songs, concluding with “I Would Take Up the Bandura” to a loud applause and standing ovation. Like every other day, this day also needed to come to a conclusion. Everyone was hesitant to lose the feeling of community and camaraderie, and long after the curtains closed, and the tables were cleared, people milled about in little groups talking and forging new bonds with their new “family” members. His Grace Bishop Daniel also having fulfilled his duty as Mary, found the energy to also fulfill Martha’s role by remaining behind and visiting with people. His Grace had a kind word, a smile, a hug, a piece of advice for each and every individual. Everyone was crying and smiling having gotten just what they had needed from their Shepherd. Thank you to everyone who so kindly joined us for our celebration. May God always keep you safe, grant you health and may you know no sorrow. 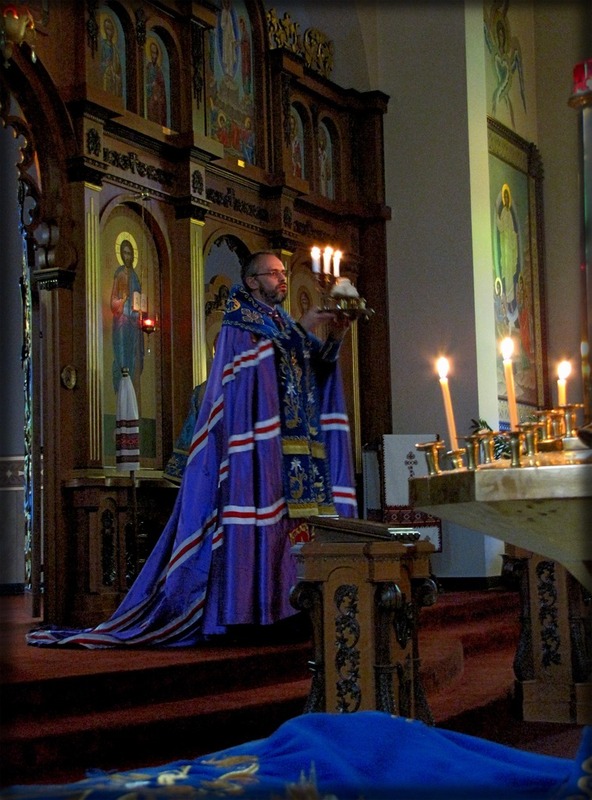 While the church building is now empty, there still lingers the scent of incense, and the vague sounds of the chiming bells and joyous singing from the Hierarchical Divine Liturgy. While the building is empty, the parishioner’s souls are full. Full of joy, full of peace, and full of anticipation, as we all await the return of our beloved hierarch His Grace Bishop Daniel for our next Feast Day celebration. 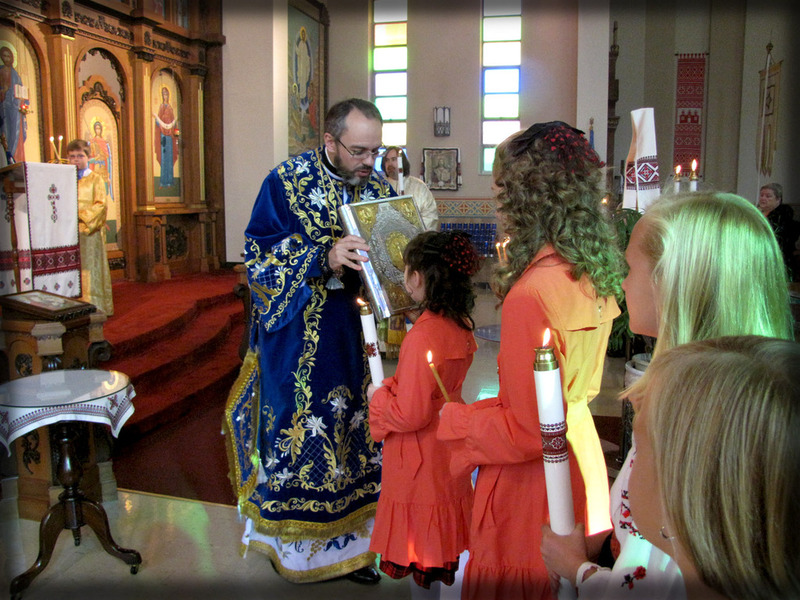 Happy Anniversary St. Mary Protectress Ukrainian Orthodox Cathedral in Sothfield, MI! Eis polla eti, Despota! Many Years, Master! Pre-Sobor Activities at the Spiritual Center of the UOC of the USA!